The Spring 2016 season is generously funded by a grant from Southern Exposure's Alternative Exposure: Round 9. Thank you SoEx! Thank you to all of our supporters: Megan and Rick Prelinger at the Prelinger Library, Rose Lavelle and Scout Books, Edward and Amy Huson, Colpa Press, and the Spring 2016 curatorial committee. Claire and Tesar Freeman are artists and art workers who make projects together about the revision of history and the physical vessels of ideologies. Their research-based work is made through shared conversations, Wikipedia investigations and primary research yielding suppositions enacted through material and contextual interventions. Jordan Karnes is a writer from Bakersfield, currently living in San Francisco. Her work has appeared in Actually People Quarterly, The 2015 San Francisco Boog Reader, The Believer, Transmission Journal, Explosion Proof Magazine, and McSweeney's. She received her MFA in Writing from California College of the Arts in 2012, and now teaches creative writing and publishing to high school students at Oakland School for the Arts. Prior to teaching, she worked at McSweeney's Publishing in San Francisco. Her first book, a collection of personal essays, It Hasn't Stopped Being California Here, was published by Carville Annex Press in 2014. Rose Draper Linke, But You Must Act Now! Rose Linke is a writer and artist based in Oakland. Her work has been seen at the ZERO1 Biennial, during San Francisco's Litquake Festival, within THE THING Quarterly, and projected onto The Great Wall of Oakland. In 2015 she attended the Bread Loaf Orion Environmental Writers' Conference, where she started writing "The California Elegies", a book of lyrical non-fiction exploring cultural geography throughout the golden state. She cares most for things that don't exactly have concrete form: words as they are being spoken and filling the air, landscapes imagined and real, skies and faces, human memory and ruins. Born in Southern Europe, David de Rozas is an independent filmmaker and cultural producer based in California. He earned an MA in Art Administration from the Carlos III University, a BA in Fine Arts from the Complutense University in Madrid, and is currently MFA candidate in Cinema at the San Francisco State University. His practice combines audiovisual research, film production, and curatorial projects. His interests relate to the politics of history, memory, and identity through a range of mediums and formats. These include art center displays and program strategies, lectures, film series, documentaries, written and film essays, and other forms and sites of knowledge production. His films have been recently screened at the 2015 CSU Media Arts Festival, FLEXfest 2015, Artists' Television Access, and Southern Exposure. Recent cultural projects include One in Which We Are, a group exhibition displayed at SOMARTS and The Open Boat: Cinema and the Maritime Imaginariums film series. He is currently Manager and Curator at the SFSU Cesar Chavez Art Gallery. Born in Bahia, Brazil, Rodrigo Sombra is a cinema scholar, freelance writer and photographer. Sombra holds an MA in Cinema Studies from San Francisco State University and his research interests concern Brazilian cinema, film philosophy, post-colonial theory, and the interface between cinema and history. His work has been published in major Brazilian magazines and newspapers such as Carta Capital, Piauí and O Globo, and he recently contributed to the collection "Race and Ethnicity in American Film: The Complete Resource" (Greenwood Press, 2016), edited by Prof. Daniel L. Bernardi and Prof. Michael Green. His photographic work was exhibited in The AfroBrazilian Museum (São Paulo) and in art galleries in San Francisco, California, and appeared in publications such as Der Greif and Fotografia Magazine. Carolina Magis Weinberg, Monumental Disorientation: Where is Columbus? Carolina Magis Weinberg, born in Mexico City 1990, has been devoting her life to understanding art and how to be an artist for the last seven years. She earned her undergraduate degree as a visual artist from the National School of Painting, Engraving, and Sculpture "La Esmeralda" in Mexico City, in 2013. She is an artist of sight and site. The primordial quest in her practice is to discover the multiple dimensions of invisible space, the stories that conform absence, the gesture of a monument, the movement of a center. She is intrigued by the landscape and how it can be politicized and monumentalized through the analysis of certain phenomena such as snow, rain, and sunshine. Her work has been part of several group exhibitions in Mexico, Colombia, France, Germany, and the United States, and she has had two solo shows in Mexico City. She is currently a Fulbright, FONCA-Conacyt, and a Hamaguchi scholar in the California College of the Arts in San Francisco where she is studying a dual Master Degree in Fine Arts and Visual Critical Studies. Samuael Topiary is an interdisciplinary media artist and writer, currently pursuing a hybrid theory/practice PhD in Film & Digital Media at University of California, Santa Cruz. Her research and creative work integrates landscape theory, documentary, experimental film, environmentalism and urban studies. Her media work has been presented throughout the US and internationally, and she has taught at the School for Visual Arts, CUNY College of Staten Island, Pratt Institute, New School University in New York City and at UC Santa Cruz. Annie Danis is a Berkeley Graduate Fellow in the department of Anthropology, at UC Berkeley. Her work explores the intersection of art and archaeology through a sensory approach to historic landscapes. She explores how archaeology can use new and alternative forms of mediation to engage contemporary communities, and how art can use an archaeological sensibility to deepen our understandings of the materiality of history and place. She grew up driving around Los Angeles, CA and the long flat roads of the north- and south-west. She has been trying to make sense of how people, places, and things leave traces of themselves everywhere ever sense. Archaeological fieldwork and research in the Bay Area, New Mexico, Colorado, Texas, Georgia, Egypt's Western Desert, and the great museum archives of the US provide endless sources of inspiration for her use of GIS, spatial visualization, and database technologies, as well as public archaeology as an art practice, to produce self-reflexive, collaborative work. Miles Mattison likes to go places over and over again. Continually curious about the role of place in everyday life, he's attracted to the interactions between people and land. He worries about the things that make us modern, and wonders if others see what he sees in them. And so he walks and looks: making assumptions, asking questions, and investigating the evolving world around him. Finding solace in the natural, he will shamelessly find joy in the setting sun of each passing day. Kristina Fong grew up in the Bay Area, spent a decade in Minnesota (home of Victor Gruen's first enclosed shopping mall), and came back again. She is a writer and designer who has worked in museums and libraries and on the internet most of her working life. Sarah Hotchkiss is a San Francisco-based artist, arts writer and one half of the itinerant project Stairwell's. She holds an MFA from California College of the Arts and a BA from Brown University. Her latest solo show was Free Alternations at Royal NoneSuch Gallery in Oakland. She has attended residencies at the Skowhegan School of Painting & Sculpture, Vermont Studio Center and ACRE. She is the visual arts editor for KQED Arts. Selections were made by a curatorial committee, chosen from proposals submitted through an open call. 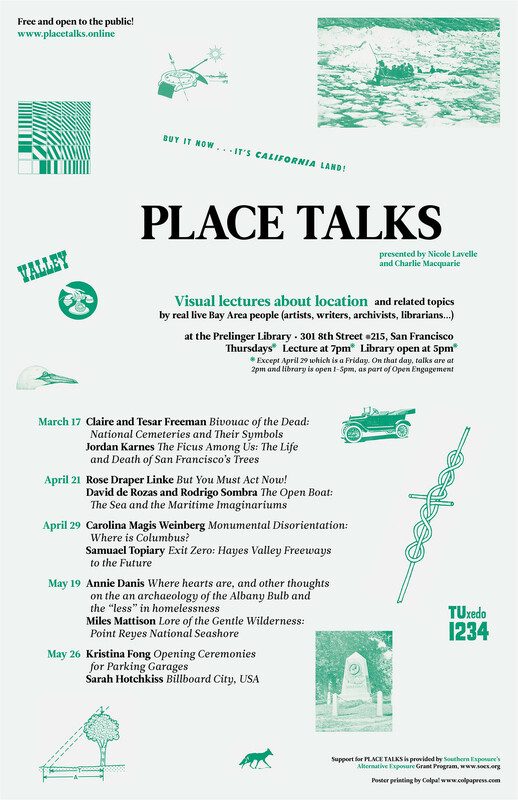 Thank you to the curatorial committee, comprised of the generous speakers from the inaugural PLACE TALKS series: Hallie Chen, Kate Dundon, Joshua Peder Stulen, and Bennett Williamson (as well as Charlie and Nicole).